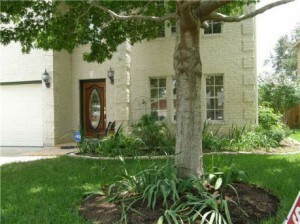 Well, it looks as though in 10 days lordaerith and I will own a house in the suburbs of Austin. It's an amazing house. It's huge and we love it. The neighbourhood is great and the schools look good. It's also close to some of my mommy friends, a giganticly awesome park, and the outlet mall. I still can't believe that we're doing this. This could seriously be our forever-house. At minimum it is going to be our 5-to-10 year house. We decided that we love the house that we are currently renting, but we didn't want to be renting anymore, and the market is really good for buying. We actually made what we thought was a reasonable an offer on our current house, but the owner totally rejected it. So we went looking elsewhere. When we saw the house we're buying for the first time, we both couldn't stop grinning the entire time. We made an offer. The owners countered. We took their counter. The inspection went well and our mortgage is now being sent to the underwriter (who I keep picturing as the Underminer from The Incredibles. I'm still sort of in shock/denial about the whole thing. Somehow I didn't think we'd find a house that we love, especially not in the suburbs. And when we did I kept expecting the mortgage to fall through or the inspection to come back bad or something. But nothing did. Of course we haven't packed anything yet. But my dad will be in town soon to help out with things and we're going to have a month to move (provided no one breaks their arm this time around). And while I'm excited, I'm also kind of conflicted. Every time we've moved before it's either been because the place we were renting got sold from under us, we were moving to another state, or we had so outgrown where we were living that we just felt like we were on top of each other all the time (and not in a good way). This is the first time we decided to move before I've felt like I was done living in the place. Rationally I know that we'd only have a few more years here before we'd want to move (or do a major renovation to the rooms/how they're organized/the living spaces) and that it's a great time to buy. But emotionally I'm very attached to this house. It's in the neighbourhood in Austin where I always wanted to live and I like our neighbours. I love the layout. I love the open floor plan, the high ceilings, and the windows. It's the house where I conceived and brought home my son to when he was born. I have a lot of fond memories of this house. But as things start looking up, as we're starting to set up utilities at our new house, and look at what we need to buy (like a refridgerator), I'm getting more and more mentally and emotionally ready to start this new chapter of our lives as a family that owns their own house.